The winter holiday season in the city of lights would feel degrees less cheerful and inspired without the traditional Christmas markets in Paris, or marchés de Noel, that spring up every year all around the city. 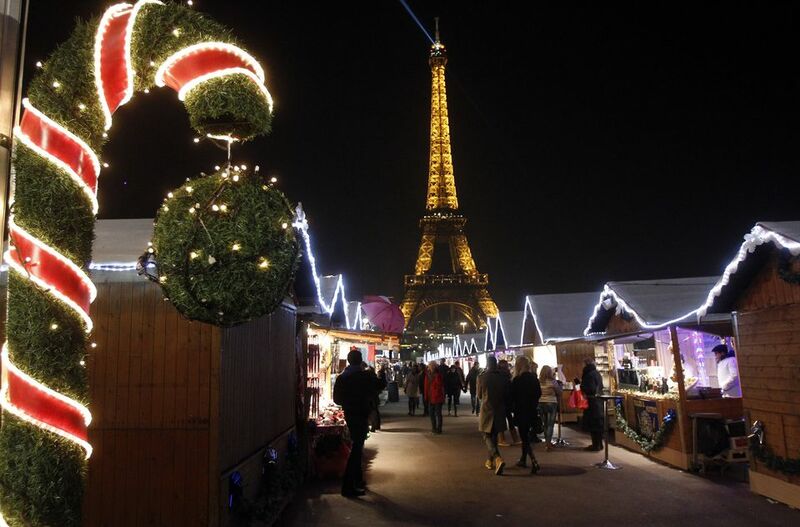 The markets, with their clusters of wooden chalets offering holiday treats like mulled wine, gingerbread, sausages and specialties from various regions of France, are an essential part of celebrating Christmas in Paris. They also make an ideal outing with kids in Paris. Visit one of Paris's many holiday markets for a scenic winter stroll, or stock up on traditional foodstuffs, handcrafted toys, clothing and other unique gifts and souvenirs. Scroll down to find information on markets open in 2018 and 2019, or read more about how to make the most of them in the sections just below. Christmas markets in Paris and elsewhere in France have their origins in the northern Alsace region, which has belonged to Germany at various junctures in history and therefore draws on German Christmas market traditions stretching to as early as the 14th century. The most famous — and largest — marché de noël in France is in Strasbourg, the capital of Alsace. All around France, including the French capital, these traditions have endured-- whether it comes to the delicious treats they peddle or the cheerful wooden chalets occupied by the vendors. Yet Paris, being France's biggest city, has some of its own traditions, too. Keep reading to learn about what makes the capital such a draw card for tourists during the festive year-end season. Like its counterparts in Alsace and around the country, the marchés de Noel of Paris offer plenty of things to see and do, from shopping, nibbling and drinking (see more below) to fun activities for the whole family. Kids will especially appreciate the "Santa's Village" operations at many of the city's markets. These include visits with Santa and his elves, rides and games and (on select years) ice skating or pop-up snow parks. Of course, Christmas lights are another delightful attraction to enjoy at the annual markets. The chalets and surrounding streets are strung with festive lights, bringing warmth and joy after dusk. What to Eat at the Markets? There are plenty of delicious treats to sample during a whirl through the markets. First, on a cold day, you might head to a soup stand like the one below. Traditional soups, from French onion to vegetable, are served from heavy copper cauldrons, adding ambience as well as warming comfort. Next, why not sample one or more of the following delicious specialties: traditional Alsatian sausages and French cheeses, hot roasted chestnuts, crepes filled with cheese and mushrooms or Nutella, Christmas cookies, macarons, gingerbread or spice bread? Most of the markets around Paris peddle these and many other seasonal treats, so we advise that you not worry too much about calorie counts when you visit. Finally, indulging in a good, hot cup of mulled wine is an excellent way to warm body and spirit. Laced with cinnamon, clove and other spices, gluhwein is a Germanic and Alsatian speciality that's become popular around the world as a holiday drink. Of course, not everyone will want the alcohol: Kids and those who don't drink can always enjoy a steaming cup of spiced apple cider as a special treat. If you're in the market for a unique gift or souvenir from Paris, Christmas markets are an ideal place to look. Numerous artisans from all over France reserve stalls, selling wares from painted ceramics (shown here) to woolen hats, mittens and gloves, gorgeous scarves, wooden toys, kitchenware with a regional touch and handcrafted jewelry. This is also an excellent way to choose a unique Christmas decoration to adorn your tree back home, or send to a loved one. Christmas Markets in 2018 and 2019: Where to Head? ﻿Note: This page will be thoroughly updated throughout October and November as this year's precise market dates are announced. Please check back for more information later in the year. No matter where you're staying during your holiday trip to the French capital this year, you're bound to find a market close by. Sadly, due to an ongoing dispute between Parisian city authorities and the main vendor who historically operated the Christmas market on the Champs-Elysées, the city's largest and most beloved, was canceled for the second year in a row. This has come has a major disappointment for the some 15 million visitors who flocked on the market every year. The good news? The enormous operation has been transferred to an area nearby the Jardin des Tuileries and the Louvre Museum, to the likely delight of visitors and locals who would have missed the traditional installation on the Champs. As for the world's most-recognized avenue itself, it will still be strung with thousands of festive holiday lights starting in late November, so it won't be completely bereft of holiday cheer. Featuring around 100 "chalet" stands, rides for kids and an ice rink, the Tuileries Christmas market is slated to bring fun and warmth for all in 2018 to early 2019. Boasting upwards of 300 stands selling everything from artisanal and regional products to decorative objects and toys, this is one of the largest and most festive holiday markets around-- in the surreal setting of high-rise buildings and the looming white structure of the Grande Arche de la Defense. Open: From November 21st through December 29th, 2018, 11:00 am to 8:00 pm. Featuring some 100 stands peddling gifts, decorations and goods perfect for the Christmas season, in addition to an ice-skating rink and "snow village", this is an idyllic spot for feting the holiday season at the foot of the Eiffel Tower. It's also ideal for the kids, who'll find plenty to keep busy. Open: Late December 2018 through early January 2019 11:00 am to 8:30 pm. For the first time, a holiday-themed market is springing up outside Paris City Hall (there was traditionally an ice rink set up on the same square, but they've decided to discontinue it). Enjoy festive decorations, warming treats, toys, games and artisanal products, most of which originate in the Paris region. Hint: You can also head across the street to the BHV Department store to take in the sight of their elaborate, fairy-tale inspired holiday window displays. This market makes the picturesque St-Germain neighborhood even more so: a Christmas village complete with decorations, toys and delicious goodies pops up in front of the St-Germain church, just steps from the metro exit of the same name. Boasting around 40 festive wooden "chalets", this market in Paris' southern hub at Montparnasse specializes in regional French delicacies. This festive market in the heights of hilly, arty Montmartre is a guaranteed joy for all, with vendors selling gifts, mulled wine, crepes and other treats. It affords nice panoramic views of the city from up high, too. This market, nestled in the heart of the quaint Montmartre neighborhood, is open from 10:00 am-8:30 pm; 10:00 am-10pm on weekends. Precise dates in 2018-2018 have yet to be announced. Located near the train station heading east from Paris, this market is well-known for its Alsatian specialties (since trains at this station have the Franco-German region as a destination). This is a great market for artisanal gifts and regional treats such as gingerbread, pretzels, sausages, mulled wine, sauerkraut and many others. Cheerful chalets selling artisanal food and drink and traditional Christmas decorations are peddled at this quieter but equally charming market. This year a market dedicated to arts, crafts, and fine cuisine is set to spring up on the square Viviani nearby Notre Dame Cathedral, where a giant Christmas tree generally stands on the main plaza as well. Mulled wine, roasted chestnuts, warm chalets and even Santa Claus are reportedly set to bring the square to festive life for the holiday season. Open: December 14th to December 23rd, 2018, 10:00 am to 8:00 pm (open until 9:00 pm on weekends). A smaller, charming market comprising around 20 stands, and located at the southern tip of Paris at the Place d'Italie metro station. A giant illuminated Christmas tree also graces this market. Open: From late November 2018 through December 2018 (precise dates to be announced), 10:00 am to 8:00 pm (open until 9:00 pm on Thursday evenings). For those interested in procuring Scandinavian-style goodies and decorations, you're in luck this year: a newer market at one of Paris' quirkiest and artiest cafe-restaurants promises to deliver plenty of holiday coziness from the Northern country. The next day at the same venue, an all-vegan Christmas market promises to regale anyone who's looking for holiday treats free of all animal products. These markets are just a train or metro ride away from the city, and can provide some real village-like charm for the whole family to enjoy. Why not take a holiday-inspired day trip from Paris? The town that harbors one of France's grandest palaces has its own annual market, complete with warm chalets selling gifts, wintery treats, decorations and gifts from local artisans. This year, the market is being held on the grounds of the Orangery at the Domaine de Madame Elisabeth. Train: Take RER Line C5 to Versailles/Rive Gauche. This adorable medieval village outside Paris features a fortified tower, walls, and moats. Its Christmas market is delightful and offers regional products including artisanal honey and rose jams. Train: Take a regional SNCF train from Gare de L'est to Provins. This adorable little market is located just east of Paris, near the Bois de Vincennes. A relaxed, more suburban vibe reigns at the stalls here.